Quantitative tightening has been running at full speed for almost 5 months now (and for a total period of 17 months since commencing in October 2017), and with QT finally coming front of mind for investors I thought it would be a good idea to update some of the charts from my previous “8 Charts on Quantitative Tightening” article (as well as a couple of new charts and indicators). It’s also very timely to revisit this topic as the Fed has begun to get distinctly cold feet on rate hikes and QT (quantitative tightening, aka “balance sheet normalization” or “balance sheet runoff”), and speculation is growing that QT1 may get put on ice as the Fed approaches its apparent deemed ‘neutral balance sheet level’ (my term – borrowing from the neutral Fed funds interest rate level concept), or as Fed Chair Powell mentioned, the “normal balance sheet“. 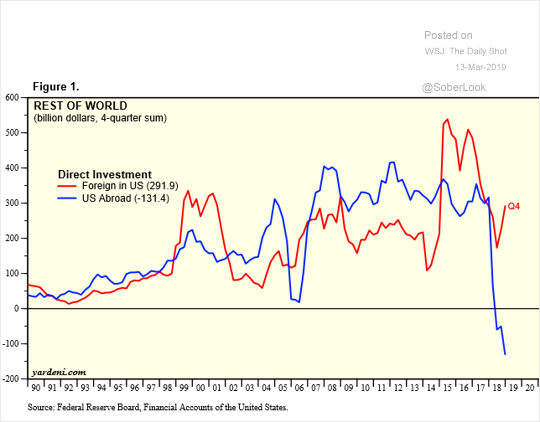 The United States: US companies have cut back on foreign investment. Copper broke out and rose above the U$2.90/lb line on February 20th. Since then, and even after its soft day or two last week, the contract has traded above that line on every day to date. It took seven months to break out of its rather stagnant trading range, but now it’s out this is obviously no flash in the pan. Modern Monetary Theory, or MMT for short, is gaining popularity in the US. It is based on the idea that under the current monetary system the government doesn’t have to borrow. Instead, it simply can print all the money it needs to fill the gap between its spending and its income. The only limitation is “inflation”. As long as “inflation” is not a problem the government can spend — using newly-created money to finance any deficit — as much as required to ensure that almost everyone is gainfully employed and to provide all desired services and infrastructure. It sounds great! Why hasn’t anyone come up with such an effective and easy-to-implement prosperity scheme in the past? Of course it has been tried in the past. It has been tried countless times over literally thousands of years. The fact is that there is nothing modern about Modern Monetary Theory. It is just another version of the same old attempt to get something for nothing. Below is a summary of my post-CPI tweets. About 6 minutes to CPI. Consensus calls for 0.2% on core. The last few have been 0.20, 0.23, 0.18, and 0.24.
y/y core should stay at 2.2% after rounding – We are dropping off 0.174% and it would take a really weak figure to push y/y lower and a really strong one to make it round to 2.3%. Last month, one of the big drivers was primary rents. Pundits saw last month’s CPI as very strong; I thought it was only slightly above expectations. It’s surprising to see the forecasts at 0.2% on core, actually, given the narratives about how strong that inflation figure was, and how it came from Rents that many forecasters are bearish on. I thought we’d see 0.1% forecasts. So we’ll watch primary rents of course, but I still think the trend in core goods is an interesting one to watch. Last month y/y core goods reached the highest level since 2013. Just barely out of deflation, but with the trade situation that’s where we want to watch. This is a pair of photographs taken by Keith Weiner, for a high school project. It seemed a fitting picture for the dual nature of money, the dual nature of wood both as logs to be consumed and dimensional lumber to be used to construct buildings. 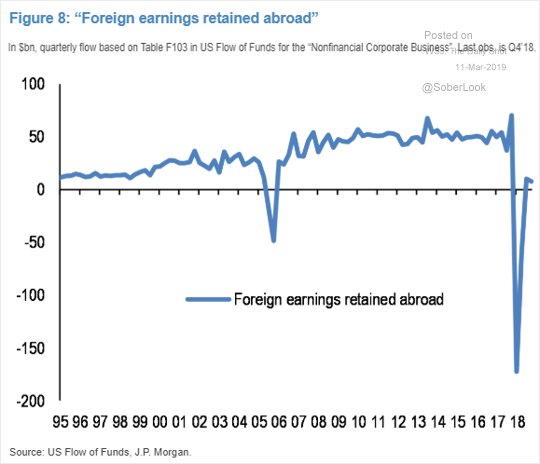 The United States: The tax-driven corporate earnings repatriation (which boosted last year’s share buybacks) is over. Well said, Adrian Day. We only hope that more Goldcorpse shareholders will join his cause and make it clear to these self-serving toerags that unless this graft is withdrawn, they don’t get the votes. 1. Philly Fed Fakeout? This chart should seem familiar to regular readers, I featured the full version of it a few weeks ago in musing on whether it was a case of “Recession or Reset?” for the US economy. I show here the composite economic confidence indicator for the USA, and one component of it; the Philly Fed Index – which is a regional business survey. There is an interesting pattern for the Philly Fed index to be somewhat manic-depressive, and it seems from first glance that sharp and extreme movements in this indicator often mark an exhaustion of the prevailing trend, i.e. a turning point. Next week is monthly options expiration week. I’ve noted several times over the years that Op-ex week in general is pretty bullish. March, April, October, and December it has been especially so. S&P 500 options began trading in mid-1983. The table below is one I have showed in March each of the last several years. It goes back to 1984 and shows op-ex week performance broken down by month. All statistics are updated. While October and December have been more reliable, March op-ex week has seen the most in total gains. Perhaps the upcoming bullish seasonality can help to market to bounce next week. I’ve been anxiously awaiting the Fed’s Q4 2018 Z.1 “Flow of Funds” report. It provided the first comprehensive look at how this period’s market instability affected various sectors within the financial system. From ballooning Broker/Dealer balance sheets to surging “repo” lending to record Bank loan growth – it’s chock-full of intriguing data. All in all, and despite a Q4 slowdown, 2018 posted the strongest Credit growth since before the crisis – led, of course, by our spendthrift federal government. Non-Financial Debt (NFD) rose $2.524 TN during 2018 (5.1%), exceeding 2007’s $2.478 TN and second only to 2004’s $2.915 TN growth. NFD closed 2018 at a record 253% of GDP, compared to 230% to end of 2007 and 189% to conclude the nineties. By major category, Federal borrowings expanded $1.258 TN during the year, up from 2017’s $599 billion, and the strongest growth since 2010’s $1.646 TN. Year-over-year growth in Total Household borrowings slowed ($488bn vs. $570bn), led by a drop in Home Mortgages ($285bn vs. $312bn). Total Corporate borrowings slowed to $532 billion from 2017’s $769 billion. Foreign U.S. borrowings declined to $207 billion from 2017’s $389 billion. “I think the yield curve could be inverted for a considerable period without significant implications for the economy as a whole, yes— possibly for some banks, but not for the economy as a whole.” He said that in testimony before the Senate Banking Committee. To our knowledge, Dr. Bernanke has not been stripped of his degree in economics for that comment, as he rightfully should be.